I feel like not much needs said beyond winter and soup. It’s almost a testament to how creative one can be during the cooler months: just how many different soups can I make? 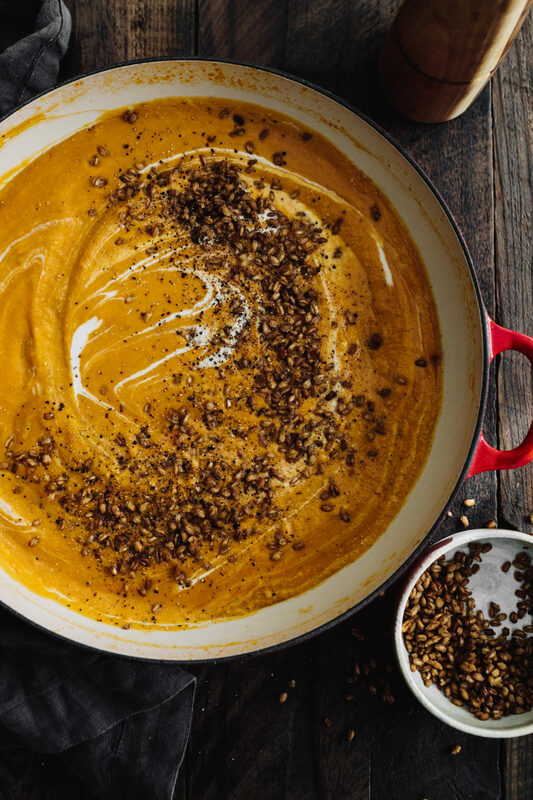 This sweet potato soup is minimal on ingredients but features one of my favorite things with leftover grains: make them crunchy. In this case, I’m using Bob’s Red Mill Farro. It brings the perfect warm, nutty flavor and it’s a great way to use up small amounts of leftover grains. 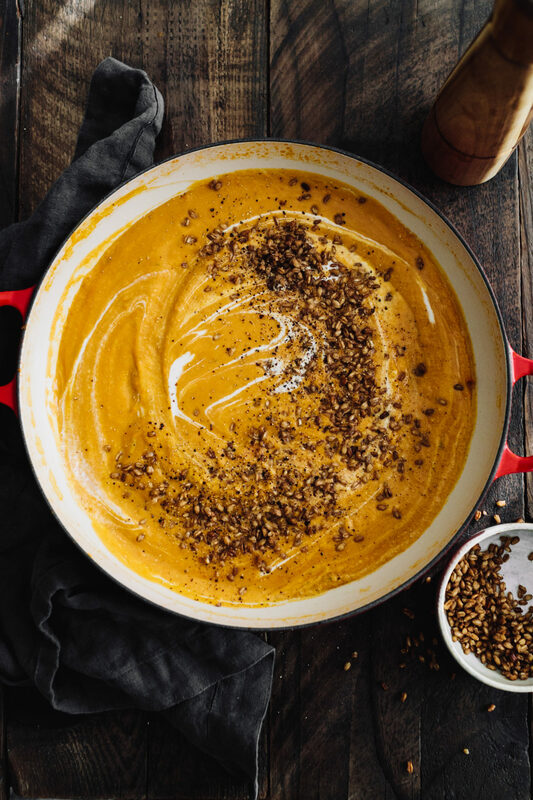 While I’m always down for a delicious creamy bowl of broccoli or cauliflower soup, my favorite is using brightly colored squash and sweet potatoes. The earthy flavor paired with solid spices and herbs is always a winning combination. However, you can easily swap out the sweet potato for something else. Try butternut squash or sometimes when I’m in a hurry, I like to pan-fry the garlic/ginger then use pumpkin puree (about 3 cups worth). When it comes to soups, I like to keep the flavors simple. Time and again, in different variations, I come back to ginger/garlic. So simple yet so good. This might also be that I’m obsessed with the ginger flavor in everything I can get. So soup makes sense! You could easily use onions or shallots with or in place of the garlic. I will say, however, that they ginger is the main flavor. It’s a bit harder to replace but you could just leave it out and up the amount of alliums you use. When it comes to soups, I need something crispy on top. Croutons and nuts/seeds are the first obvious choice. However, I’ve been in love with crispy farro. It’s a fairly extreme crunch (to which Grace mentioned was a bit like grape nuts!) It’s a perfect way to use leftover farro or if you’re me, a perfect excuse to make a pot. 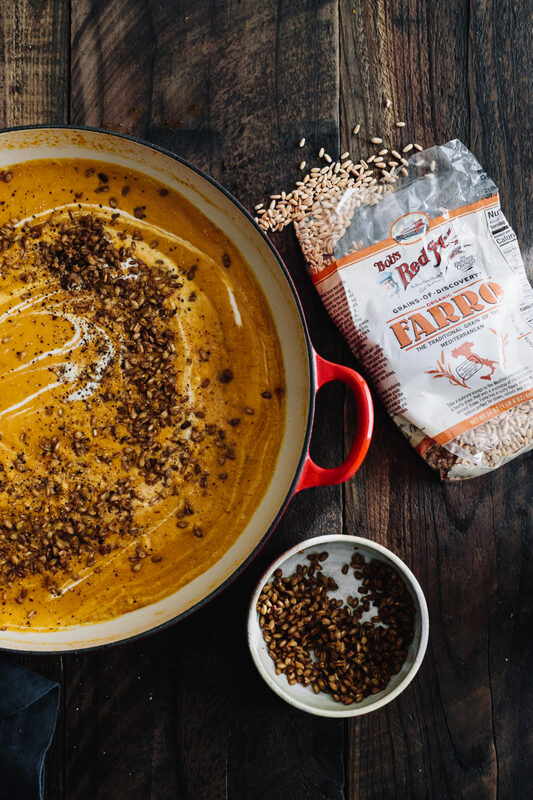 I love using Bob’s farro because it cooks up great every time. The flavor is perfectly warm and nutty and I know I can always trust the product I’m getting. Finally, a note about cashew cream. 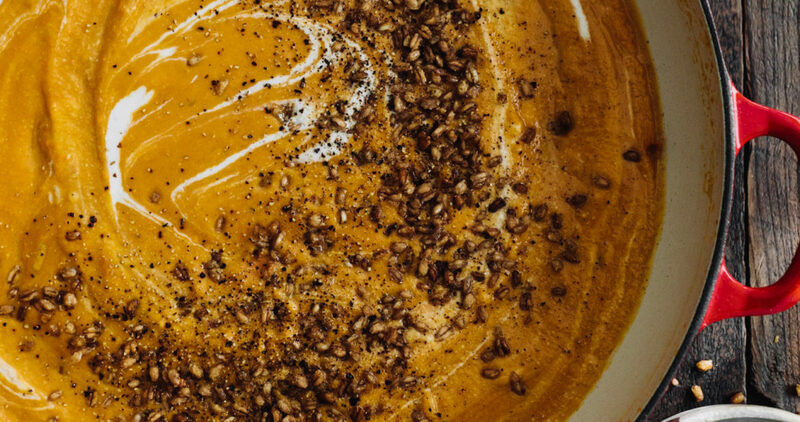 You really don’t need the cream for the soup because the sweet potatoes puree nicely. However, I love the extra level of richness the cashew cream gives. You could also get this from a splash of heavy cream or another type of nut cream. Heat a decent-sized stock pot over medium-low heat. Add the olive oil followed by the cubed sweet potatoes. Cook for a couple minutes, just to start the cooking process. Stir in the minced garlic and ginger, cooking a minute or two more. Finally, measure in three cups vegetable broth and a sizable pinch of salt. Bring to a boil, reduce to a simmer, cover, and cook until the sweet potatoes are tender; 15 to 20 minutes. While the soup is cooking, heat a skillet over medium-low heat. Add the olive oil, enough to coat the bottom of the pan. Add the farro to the hot oil and cook until the color of the farro deepens and the grain begins to crisp. Using a slotted spoon, scoop the farro from the pan and transfer to a bowl, set aside. 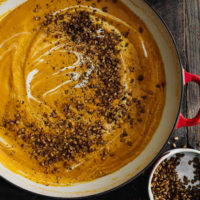 Once the sweet potatoes are tender, puree using an immersion blender or regular blender. If the soup seems too thick, add a splash more vegetable broth. Return the soup to heat after blending and heat until hot. Once hot, remove from the heat and stir in the lime and cashew cream. Taste, adjust the salt level, then top with the crispy farro and a few sprinkles of black pepper. Recommend using leftover farro (make it for dinner, save ½ cup for the next day). great soup, looks beautiful too! That crispy farro is a game changer. SO good. Fabulous! I used some yams and good half and half, and doubled the recipe along the way. Couldn’t be any better!